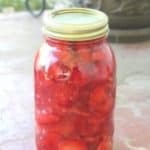 June 29, 2018 2 comments on "Strawberry Pie Filling Canning Recipe"
It’s strawberry season again! If you are fortunate enough to get to pick or purchase a large amount of fresh strawberries, you are probably wondering what to do with them all! There are many strawberry canning recipes you can try. 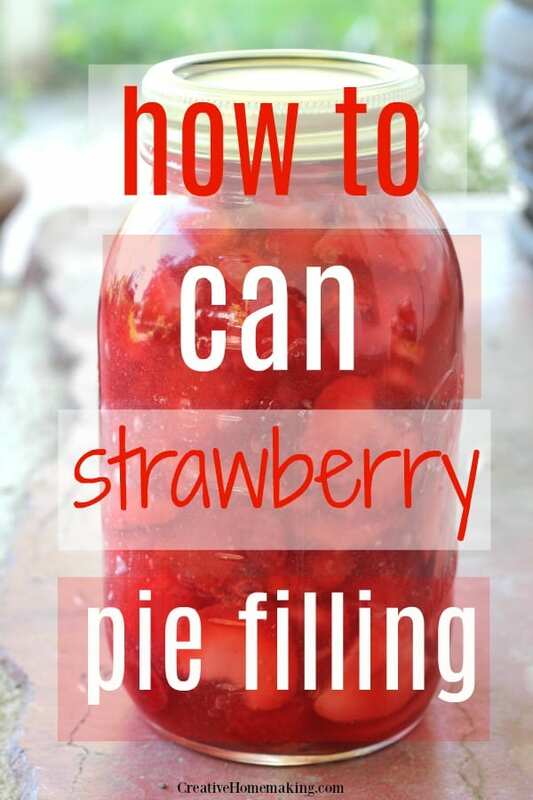 This strawberry pie filling canning recipe is very easy and you will be sure to have pie filling for strawberry pies all winter. 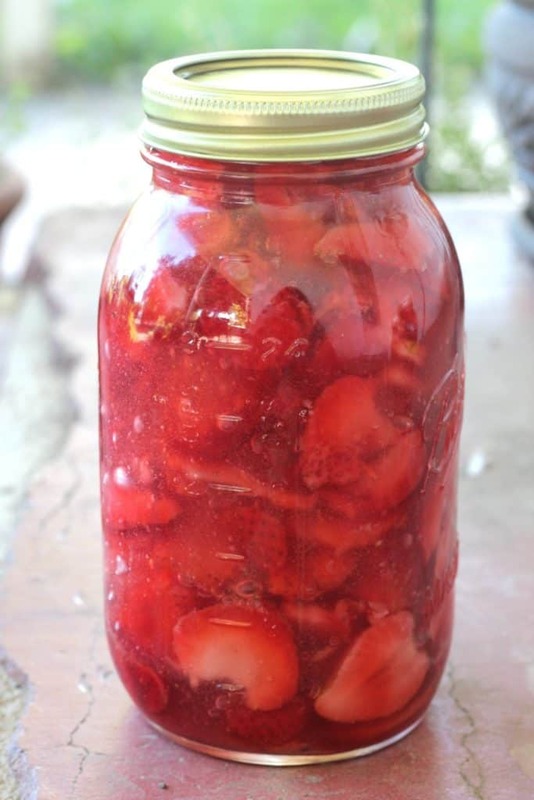 It is now one of my favorite recipes for canning strawberries. 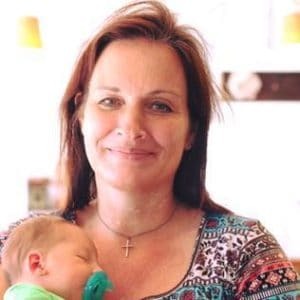 I’ve made this recipe several times, and it turned out great each time. This recipe makes two quarts of strawberry pie filling. If you want to make more, then just double or triple the recipe. One quart of pie filling is enough filling for one 9-inch pie. Don’t want to can the pie filling? You can get really inexpensive freezer containers from Amazon that will hold 1 quart of pie filling. Just pour the pie filling in the freezer containers and then place in the freezer! If you’ve never canned before, make sure you sterilize your jars, lids, and rings before you pour the strawberry pie filling into them. I sterilize my jars by placing everything in the dishwasher and running them through a rinse cycle. If you sterilize your jars, lids, and rings this way just leave them in the dishwasher until you are ready to use them. You might see that a number of recipes for canning homemade pie fillings call for cornstarch instead of Clear Jel. In case you are wondering what Clear Jel is, it is a modified form of cornstarch that is safe for canning. Cornstarch has been used in the past for canning, but canning experts are now recommending the use of Clear Jel in its place. I made fillings with both cornstarch and Clear Jel. Cornstarch is great for making pie fillings you are going to eat right away, but when you can cornstarch the consistency of it changes and it doesn’t taste as good or look as appealing as before you canned it. 2 Comments on "Strawberry Pie Filling Canning Recipe"
This recipe looks wonderful! I was curious what the texture of the strawberries was like after canning. I would think they would be quite soft after the heat of canning. Does that affect the quality at all? I’m assuming you would use this as a “fresh” strawberry pie, not cooked. Maybe you could share favorite ways to use the canned pie filling?